The OVA will connect the events of the game with the events of the movie, ".hack//The Movie: Sekai no Mukou ni", and reveal the last truth. The protagonist of the OVA will be Dave, who also appears in the main movie. The OVA will take place in both 2024 (the year in which the movie takes place) and 2025 (the year in which the game .hack//Versus takes place). Watch .hack//Versus - The Thanatos Report Episodes Online at Animegg.org. 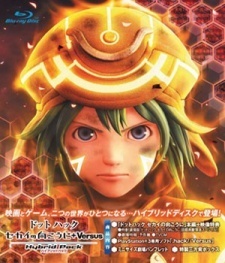 .hack//Versus - The Thanatos Report is available in High Definition only through Animegg.org. Choose an episode below and start watching .hack//Versus - The Thanatos Report in Subbed & Dubbed HD now.